It’s August, which means that students are finishing up their research master or master theses. Here is some advice that I give most of them at one point or another, and I think also Ph.D. students may not be aware of all of the following. I’ll focus on the form for now, and will talk about the contents of a good paper at a later point in time. Let’s start with the very basics. You want to make your paper to be pleasant and easy to read in terms of the font size. My usual advice is to use a font like Times with a size of 11pt, to change the spacing to 1.5 or double space, and to use margins of 3cm in the top and in the bottom, and 2.5cm on the left and right. Footnotes are usually placed after the end of a sentence, after the full stop. And acronyms should be defined before being used. You can do this by writing out the acronym and putting it in parentheses right after that. From then on you can use it. Particular sections or figures you refer to should start with capital letters. So, you would say “in the previous section”, but “in Section 3”. Equations should only be numbered when you refer to them. Also, when you have an equation that is a “displayed formula” (so takes a whole line) and the sentence ends with that equation, then the equation should end with a full stop in it. When the text continues after the equation, then there should sometimes be a comma, for instance because the equation uses something that is defined afterwards using the expression “where”. Overall, I think the best advice I can given is to be very careful so that the writing is of high quality. First of all, the English should be correct. There should not be any typos, and you should make extensive use of the spell checker. Then, the references should be in good order. The following mostly applies to Ph.D. students in economics and related disciplines. When you’re writing papers, you should definitely use LyX or LaTeX together with BibTeX. Also references to figures, tables, equations, sections, and so on should be programmed so that when you change the structure of the document or insert a section or another figure, all the references are updated. This will save you a lot of time in the future, when you go through the 10th or so revision of a paper. Generally, learn from others. In an earlier post I’ve already suggested that you should read papers in top 5 journals. Not all of them are well-written. But the chance that you get a well-written paper is higher than in other journals. Look at how introductions are structured, how the research is motivated. And spend a lot of time working out the arguments. Andrew Chesher told me once, when I was visiting UCL as a Ph.D. student, that one may want to think about the following structure: this is what I’m doing > this is why I’m doing it and why it’s interesting > this is how I’m doing it > this is what I find. I think this is a great way to think about presenting research. He also said that academic papers should not have any superfluous written text and that for every word one should ask oneself whether it’s really necessary. Thereby, one can make text shorter and ultimately more clear. Always make sure you use easy to understand and short sentences, mostly active tense, and that each paragraph roughly corresponds to one line of thought. But don’t be too mechanical. Respect the reader by explaining well. Think of your reader as not being an expert on the topic you’re writing on, but as being smart and having a general education in economics. That way, you will not make the mistake of not explaining things that may be clear to you, but not to most readers. And before I forget: many students write that “coefficients are significant”, but it should actually say that they are “significantly different from zero”. If you want to learn more, have a look at my earlier post on the challenge of writing, where I also provide a reference to Silvia’s book. And if you’re interested in working some more on your writing, you may also want to consider having a look at a classic, the “Elements of Style“. I’m from Southern Germany, and just as many of my friends who also came to live somewhere outside of Germany, one of the things I’m really missing on a Saturday morning is a fresh pretzl, with a bit of butter and maybe some cheese. I’m saying Saturday because I recall going to the bakery with my dad before breakfast to get some. And those bakeries were normally closed on Sunday. We call them “Brezeln” in Germany, and since I’m from Stuttgart I will of course claim that they were invented in Bad Urach, which is not far away. Bavarians will claim that they are from Bavaria, and in the end nobody can say where they really come from. But just as wheat beer they have made their way and are now extremely popular throughout Germany. Which is not surprising because they’re the perfect snack as they are, or with butter, so you will certainly get them on the streets or at train stations, for instance. Sometimes, in the US or elsewhere one comes across something that is called pretzel and looks a bit like it, but it is actually not a pretzel, most of the time (they are not supposed to be heavy and they are not supposed to be too crunchy or dry–instead they are supposed to be crunchy where they are thin and soft where they are thick). A pretzel is made out of yeast dough and the brown color comes from lye. So it can’t be that hard to make them I thought. It’s a bit like molecular cuisine because of the lye, though. I’ve been practicing making them myself, and I haven’t been too satisfied so far. But this morning I made some that turned out the way they should be, and in the end it’s actually not that hard now that I’ve found the right balance. So here’s the recipe. You’ll probably have to try yourself what works best, because ingredients differ across countries. So this one is optimised for Holland. I’m going to make six of them. Here’s how we do the raw dough. I used a kneading machine, but you can easily do the dough by hand. 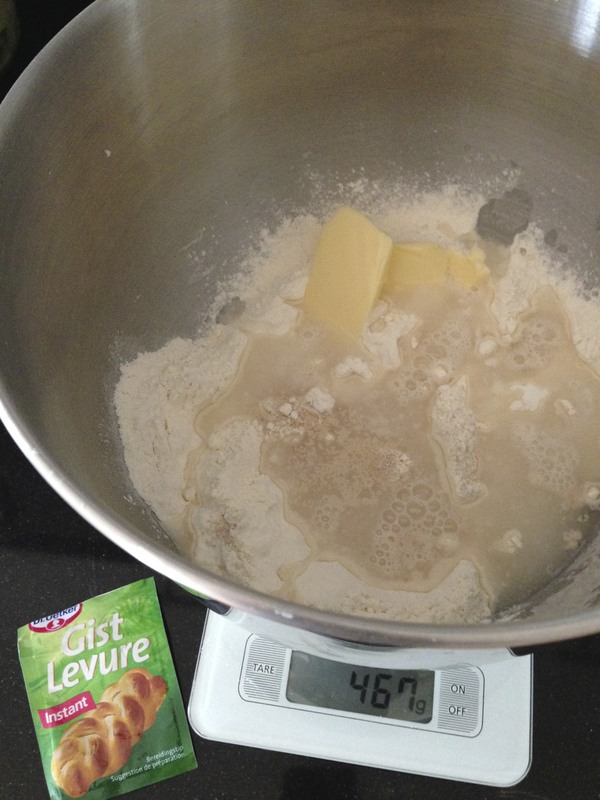 On the picture you see that I put everything into a large bowl, in the following way. Start with 300 grams of standard wheat flour. Bread buns and the like usually have 2% salt relative to the flour in them, so add 6 grams of salt on the side. Don’t mix it with the rest of the dough yet, because it’ll slow down the yeast when we put it together with the flour and water. Put in half a pack of dry yeast (or 10 grams of fresh yeast), that’s something like 3 to 4 grams, a bit of brown sugar, a bit of butter (about a tablespoon), a bit of milk, and some tepid water, about 150 mills. On the display of the scale you see 467 grams, so that’s it. You can see that I’ve put the salt to the side, as well as the butter and have dug a little hole in which I’ve put the yeast, the sugar and the water. Then I’ve stirred the water very gently so that the yeast dissolves. This will produce a watery pre-dough. It’ll form bubbles, so let it do that for 15 minutes or half an hour. Then knead the dough. It’ll be a fairly dry dough. Form six pieces out of it. Then roll them so that they are about 10 to 20cm long. This is what you see on the picture. 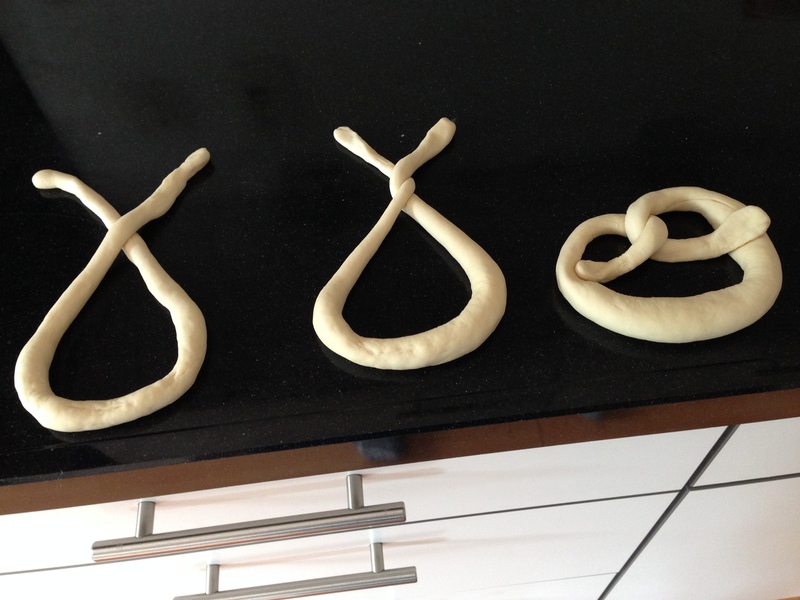 It’ll be hard to make them longer, so let the dough expand a bit more by letting it rest for 10 minutes. Roll and pull at the same time. Leave them a bit thicker in the middle (about twice a pencil’s diameter). Now it’s time to form the pretzels. The picture shows how it works. There’s no need to rush, you can do this step by step. Place them on a baking sheet with baking paper underneath and wait. Now it’s important to wait a bit, so that he dough expands, but not too much because then it gets too fluffy and will be dry. I’d say wait about 10 minutes. Now it’s time to put lye on with a brush. It took me a while to figure this out, but you can actually get lye from the Asia shop. 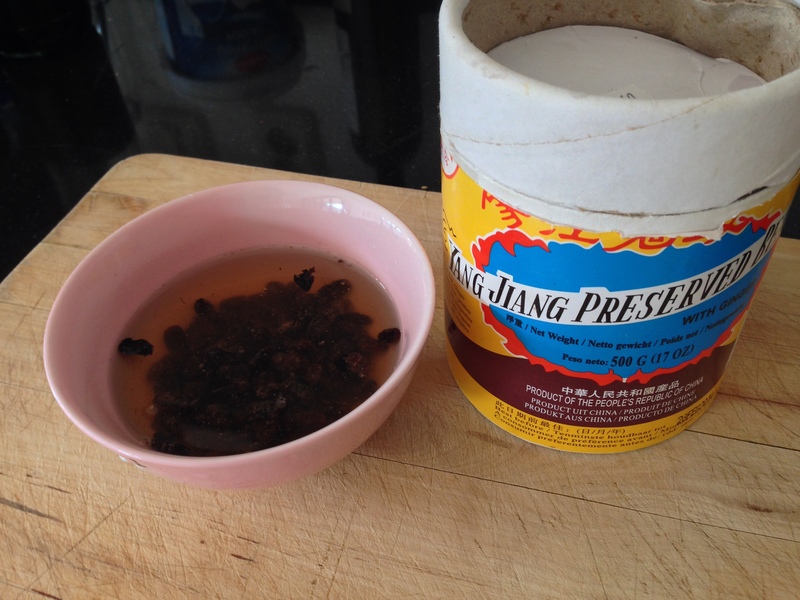 In Chinese cooking, lye is used to make some noodles, for instance. I’ve thinned it down a bit with water and have also made sure that I go with the brush a bit underneath the raw pretzels. You can also use natron powder from the baking section, or natron lye from the pharmacy. Finally, put coarse salt on top and use a sharp knife to make a cut in the thick part. Bake for 16 to 18 minutes at 210 degrees Celsius. Good luck! The following post is a slightly altered version of a column I’ve written for our student newspaper (see page 8 of the November 2011 issue of Nekst). In Tilburg, we have a separate department of econometrics, which I am a member of. Wikipedia says econometrics is the discipline that “aim[s] to give content to economic relations”, citing the New Palgrave dictionary in economics. A sub-discipline of it is theoretical econometrics, which is concerned with statistical properties of econometric procedures, among other things. When people say econometrics in the Netherlands, this is what they mean. But actually, econometrics is much broader. The most prestigious journal of our field is Econometrica, and when you visit the website looking for the “aims and scope” of it, then you will find that it “promotes studies that aim at the unification of the theoretical-quantitative and the empirical-quantitative approach to economic problems and that are penetrated by constructive and rigorous thinking” (emphasis added; you find a similar statement for the Journal of Econometrics). Interestingly, the ultimate goal is given here, namely to study economic problems. Studying statistical properties of estimators is part of it, but ultimately we want to answer questions that are interesting in the eyes of economists. This brings me to the general approach in economics. Most economists study economic problems by means of models. An economic model is an abstraction of the world, which is made to focus on just a few aspects of human behavior and interaction. It is phrased in terms of assumptions, and one can think of it as a tale. We tell a story, and thereby hopefully learn about the big picture. Econometrics is of course concerned with the empirical side to this. When you read an applied article in the Quarterly Journal of Economics, then you will often see that people exploit, in one way or another, exogenous variation to learn something about the average causal effect this variation has on some outcome. They then call this a reduced form approach, because they don’t estimate what the mechanism is through which something has an effect on something else. But they then move on and interpret their findings, having particular mechanisms or a class of models in mind. For example, when interpreting findings on unemployment duration, they will interpret their findings against the background of job search theory. Traditionally, there is a heated debate between followers of this approach, and followers of the so-called structural approach to econometrics. The structural approach is to spell out an economic model, and to estimate parameters of that model. Having the estimated parameters in hand, one can simulate how people would react to a policy change such as a tax reform that has not taken place. In a recent issue of the Journal of Econometrics, Michael Keane propagates the latter, in a somewhat provocative article. What may seem confusing in this context is that every structural model has so-called “reduced forms”, which one gets by solving the model and expressing some of the variables as functions of the other variables. Under the right assumptions, this yields an equation that is linear in parameters, and that can also be estimated. Then, one estimates structural parameters from a reduced form equation. But these are often not the same reduced forms people have in mind when they read the Quarterly Journal of Economics. So, one way to confuse them is to ask what the equation they are looking at is a reduced form of (but many of the authors will actually have a good answer to this question). In any case, Tilburg does not take sides in this debate. There are people who pursue the reduced-form approach, and people who pursue the structural approach, also within our department. The latter have recently formed a group, and you can check their website in case you are curious. In our seminar series, you can see the whole variety of things econometrics has to offer, and you are of course welcome to attend. The following is a slightly modified version of a column I’ve written for the July 2012 issue of our student newspaper Nekst. Last time (see here, page 8), I’ve talked about doing a Ph.D. in economics, and that made me realize that there is one challenge students and professors share, namely the challenge of writing. As a student, one “fears the empty page”, one finds it hard to start writing, even though one already knows a lot about the topic, say when it comes to writing a thesis. Or a term paper. Instead, one does some more reading—it never hurts, and if one know what one is talking about, then writing is up is going to be really fast, right ;)—, and one says to oneself that whatever one writes one will have to correct in the future anyways. Well, that’s all fine, but in the end it’s normally not the case that the last days before some deadline are like all the other ones. Rather, there is a rush of “productivity” to finish up what one has started—well, too late, in the end. I write “productivity” in quotes because if you are honest, then it resembles more finishing a project under a lot of stress, so one could have done better had one only started earlier. Another example of a deadline, by the way, is the date of the next meeting with your thesis advisor. Sounds familiar? It is surely familiar to many people who engage in writing, not only students. So we’ve identified a problem. There is no easy way out, but actually, there is quite a bit one can do. A couple of years ago, a colleague pointed me to a book by Paul J. Silva called “How to write a lot: A practical guide to productive academic writing”. I liked it a lot and would like to strongly recommend it to you. The topic is not only writing, it’s also about organizing your work. And about getting things done. Actually, I’ve already mentioned the book in an earlier post. The author starts by describing typical patterns, for example the “productivity rushes” I talked about before. Then he says that writing is hard work and motivates the reader to think a little bit about the whole process of writing and organizing one’s work. He does this in a very nice way, describing tactics and actions one can take. Everybody has his or her own optimal strategy. He himself prefers to have a strict routine that involves getting up and basically going straight to his desk with a cup of coffee. Then he starts working immediately, without internet access, and by lunch time he’s done with the hardest part for the day. Then he does all the other things, like answering emails, participating in meetings, and talking to people. That way, by having 3 to 4 really productive hours early in the morning, he gets a lot of things done, just because he does this every single day. And after some time he could again take his weekends off, and this made him even more productive during the week. Another important advice he gives is that it’s important to prioritize and to do the things first that are most important, and not the ones that are most pleasant (like checking what’s going on on Facebook or in one’s inbox). My dad once told me that he always does the things first that he finds the least pleasant, another good strategy I think. He also talks about the importance of making realistic plans (than one does not always have to revise) and that a first draft of something is never perfect. But all this is just a little glimpse into what I found an incredibly useful book. I think it’s a great investment to read it. You can easily do that in an afternoon, if you keep you computer shut down. Silvia, Paul J.: How to write a lot: A practical guide to productive academic writing, American Psychological Association. (2007), Washington, DC, US. This was originally a guest post of mine on Meltem Daysal’s blog. Before we get started we put on some rice. Here you see our rice cooker, but of course a pot on the stove will do as well. Pandan rice is nice for this dish. 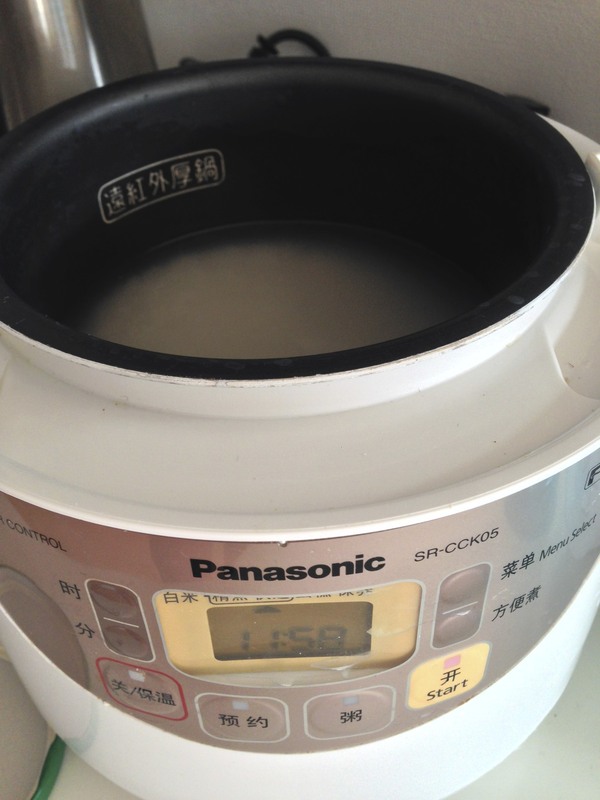 Make sure you wash the rice, then put it into the rice cooker and or the pot and boil it. If you use a stove make sure you use enough water, then bring it to the boil, let it boil for a bit and then don’t open the lid but let it stand for 15 or so minutes. I’m a big fan of exploring traditional dishes and really trying to get to the idea of the dish. The most important ingredient for our dish today are black beans. You can get them in any Asia store. These are actually fermented and salted soy beans called Douchi (豆豉). It’s apparently the oldest known food made from soy beans. They have a salty taste that reminds me a bit of bacon, so no wonder steamed salmon with black bean sauce is so tasty. Soak them in not too much warm water. If you have time, then it’s a good idea to do this some 10 or so minutes before you start cooking. Today we’re going to do a stir fry. 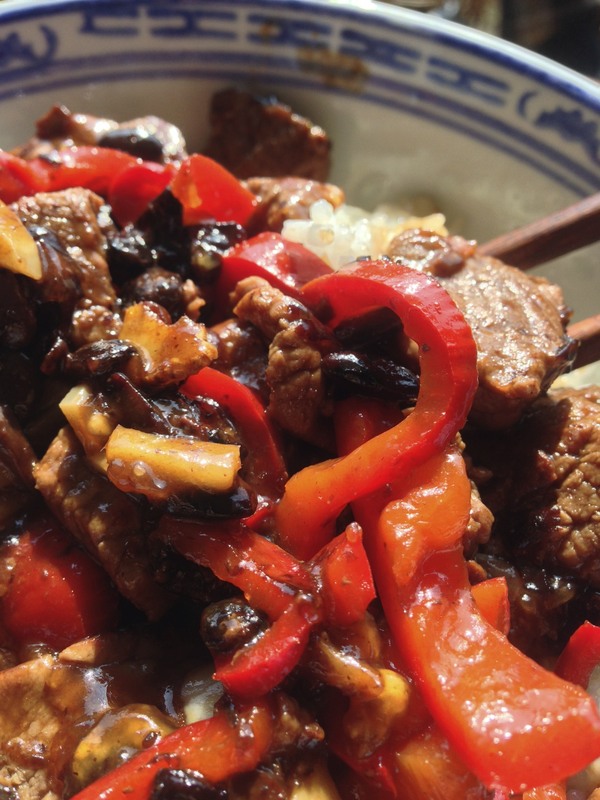 Asian dishes don’t use a whole lot of meat. For two persons a nice steak will do here. Slice it thinly against the grain. I really like to use a super sharp knife, it’s just so much fun to cut with it. Then we put some regular oil into a pan, ours is not too big and looks a bit like a wok, and fry the meat. I put my stove on the highest temperature. 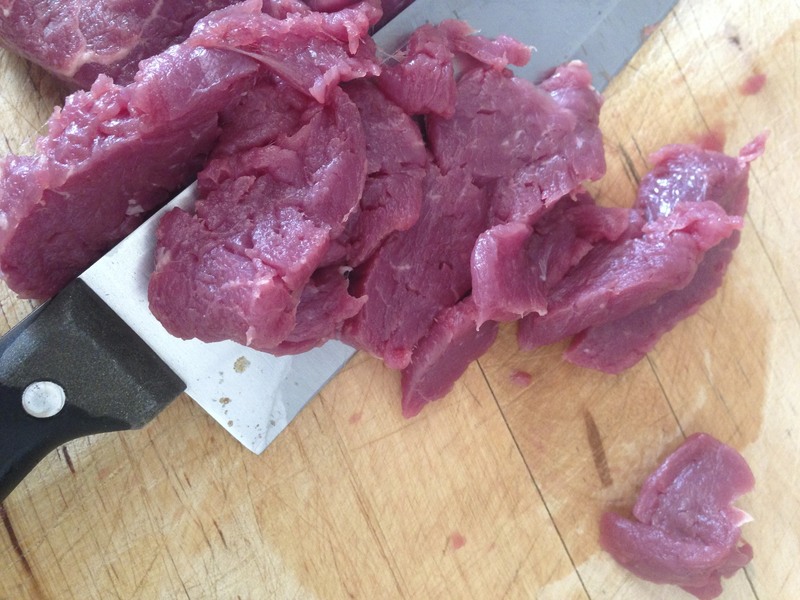 Unless the meat is of super high quality some water will come out, wait until it’s gone and the meat is a bit brown, but don’t leave it in there too long. Otherwise you kill the taste. This took about two to four minutes. While we handle the pan to turn the meat we cut some pepper, garlic and ginger. Next put in the garlic, ginger and pepper. 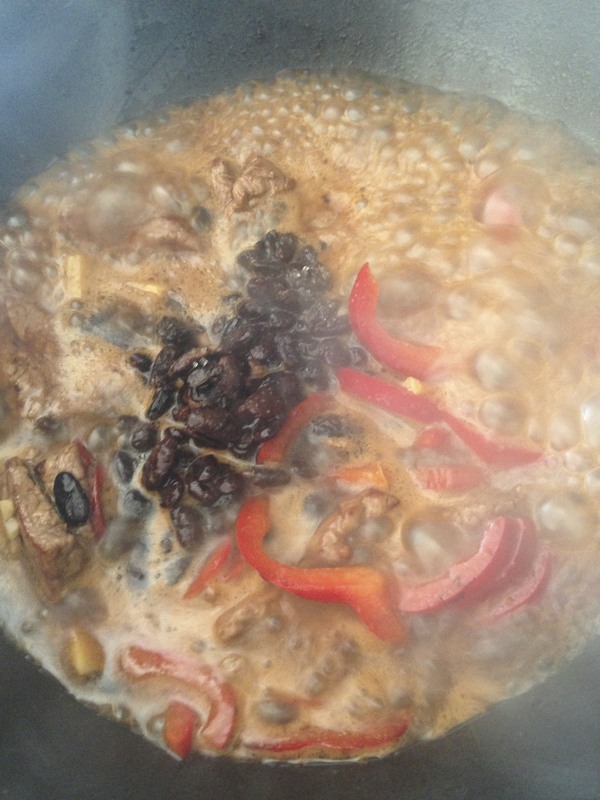 Add the soaked black beans and some of the liquid. Next, we add some soy sauce, something like four tablespoons, and a bit less rice wine. Make sure you don’t use Japanese soy sauce. I took the light Chinese one. You can get it, together with the rice wine, in any Asia store. Finally, add some sugar and a bit of cornstarch. The latter will make the sauce some thicker, which is a nice texture for this dish. That’s by the way something interesting I didn’t realize for a long time. A lot of the taste is about texture anyways. Leave it on the stove until the sauce thickens. The beans will dissolve and everything will become a creamy, tasty, salty sauce, with a nice tone of ginger and garlic. I put everything into a bowl and that’s it—enjoy!